PATRIOTIC Front (PF) deputy secretary-general Mumbi Phiri says Zambia has in the last four years under its administration intensified preaching and practising national unity and peace. Mrs Phiri said the practice stems from members and the leadership of the ruling party and it is aimed at helping sustain peace and unity in the country. She said this is demonstrated and re-affirmed by President Lungu’s bold pronouncement to re-dedicate Zambia as a Christian nation and the declaration of October 18 this year as a national day of prayer and fasting. 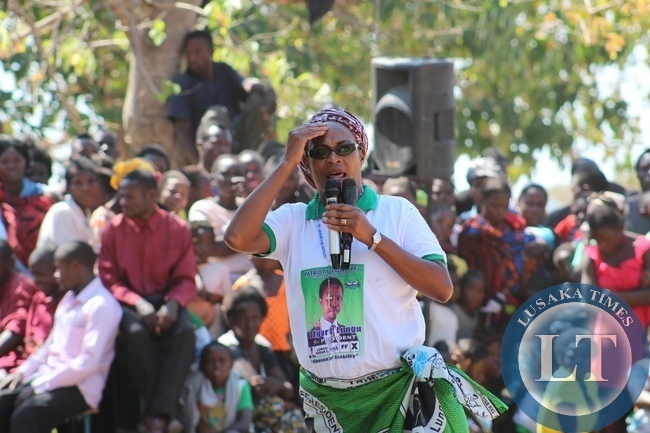 In a reflection of the fourth anniversary of the PF in office, Mrs Phiri said the ruling party has rejected the use of tribe to bar participation of its members in intra-party democracy. “The right to aspire for leadership in the party transcends tribe as we demonstrated following the death of our founding President Mr Sata. This crucial feature is as rare as a dog’s horn in some known political parties seeking power. “PF continues to make a consistent case on why we must change the way we do politics as a nation. PF believes that we must co-exist for a better Zambia, and our PF political leadership has continued to espouse humility, dedication, helping the weak and providing selfless service to the nation,” she said. And Mrs Phiri said the PF leadership has remained resilient to provide leadership and guidance to the nation, amidst strong criticism and verbal abuse from some sections of the media and their agents. She said the PF has principally contended that true courage by competitors and adversaries alike is not in how much they insult and demean President Lungu. “To the contrary, true courage is when they can provide solid policy alternatives to Government. The PF in Government is always ready to interact with such serious checks and balances,” Mrs Phiri said. And Mrs Phiri has commended the PF leadership and membership as the ruling party has remained strong and attractive. She said this is validated by the party winning seven parliamentary by-elections since January 20, 2015 when President Lungu was elected into office. “They are still working hard to consolidate PF’s gains in this democracy. We thank each one of you for keeping the PF dream alive. I want you to know that your leadership will do more to celebrate you because without you, there is no PF,” Mrs Phiri said. Seating on the tip of her tongue is the word [email protected] She can not deliver a speech devoid of that T word. From the abundance of the heart, the mouth speaks. Mumbi the who.re always contradicts herself.i think she was told that her only relevance to the party is to keep yapping rubbish every time. Just the first paragraph put me off! Why take the trouble of talking about tribal issues if the PF is what she claims it is? Everybody knows that the truth is the opposite of what she says. Some things are better left unsaid. It seems now Mumbi Phiri has got nothing else to talk about apart from Tribal issues on the Political scene.Madam the tribal thing you keep talking about has now become a ‘Cliche’ in the electorates’ minds.Find another campaign strategy not vama tribe, its no longer working and infact it’s the one that will hurt you next year if you are not careful.People are now looking for a Leader who is going to show Leadership in mitigating and solving the Economic hardships this country is going through not always talking about tribal things….Madam tribal talk will not stabilize the Kwacha!!!!!. We want solutions from the PF government because that’s what you were elected for Madam!! The qualifications required for PF leaders is simple. They need to be able to consistently TELL LIES, even when the facts and the truth are perfectly obvious to everyone. Disaster Kambwili is the perfect example of that. I’m a Christian but can never pray for the PF; to continue plundering?